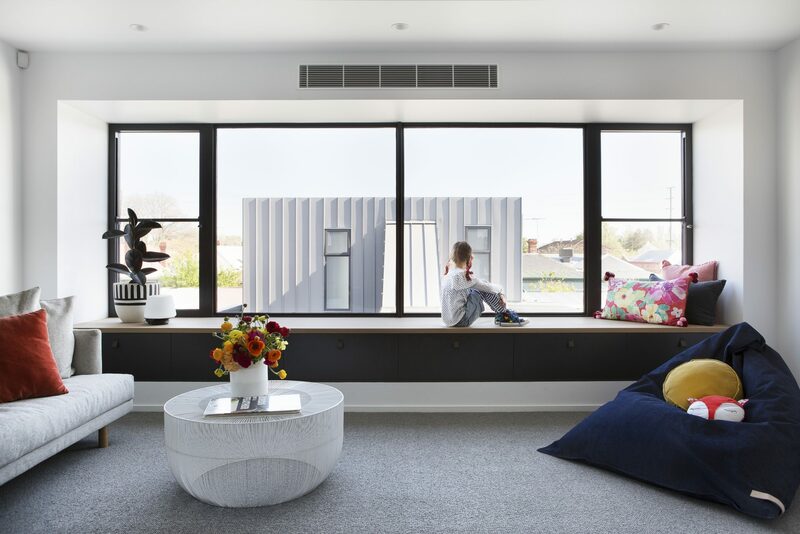 Old Meets New - Creating a Northcote Family Home - BuildHer Collective. 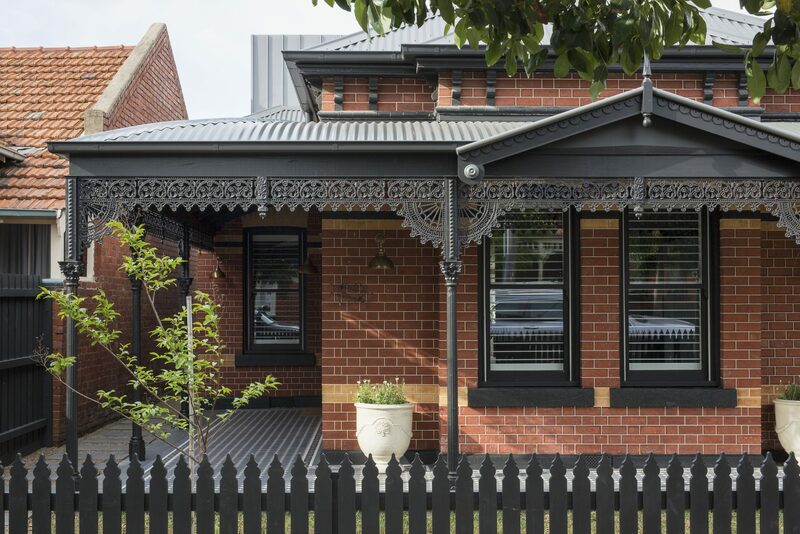 Built in the early 1900s, this inner northern city block was in need of a transformation. Hatch Design + Construction could see its potential and have brought the Victorian home back to life by creating a striking frontage and a contemporary rear extension. The heritage façade has been beautifully restored, presenting tuck pointed red bricks, dark trimmings and a speciality designed mosaic leadlight. Oh and of course, the antique brass light fittings – the first of many subtle brass touch points throughout. 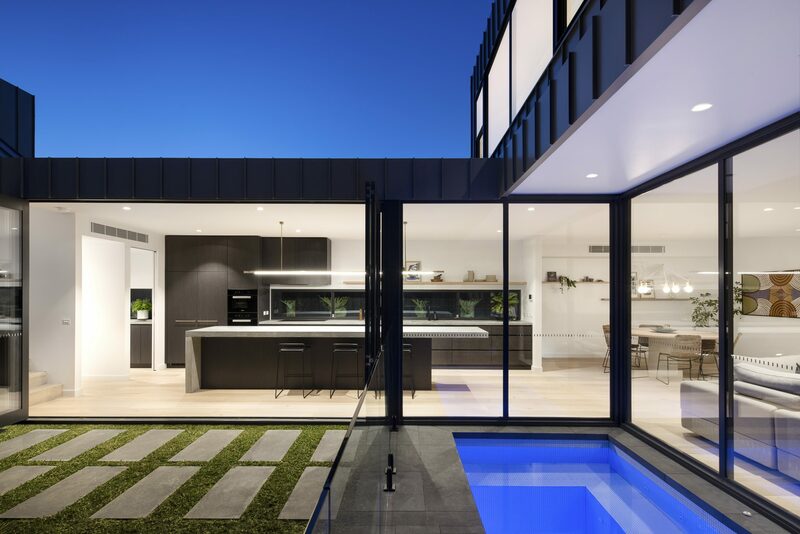 Careful consideration and sophisticated spatial planning with architects Bellemo & Cat has provided the home with five bedrooms, including a master suite and an additional studio, two living areas and a well-integrated external courtyard. The floor to ceiling windows wrap around the saltwater plunge pool and garden, allowing natural light to flood the open plan living space. 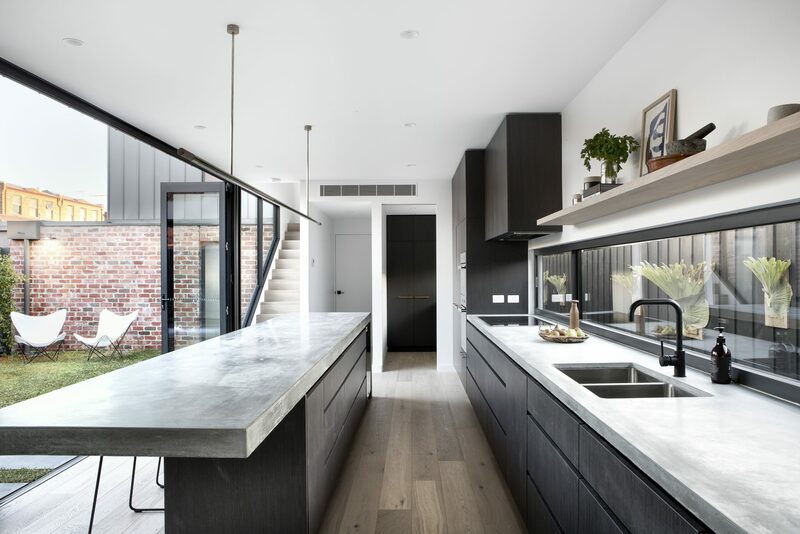 What’s even more impressive are the floor to ceiling bi-fold doors that run length of the 4.5metre kitchen bench, opening the linear space into a large entertaining area. It doesn’t get much better than the combination of timber and concrete, and this home has married them perfectly. Beautiful oak floorboards and custom made concrete bench tops make all the difference. Did we mention the island bench is 4.5 metres long? Well, the window bench measures a whopping 5.4 metres! The determination to get the concrete process correct has resulted in an admirable seamless bench top, particularly at such a large scale. Let’s not forget about those brass touch points; to seal the deal a custom made brass and oak tube light hangs above the concrete bench top. The quality of finishes doesn’t end there. 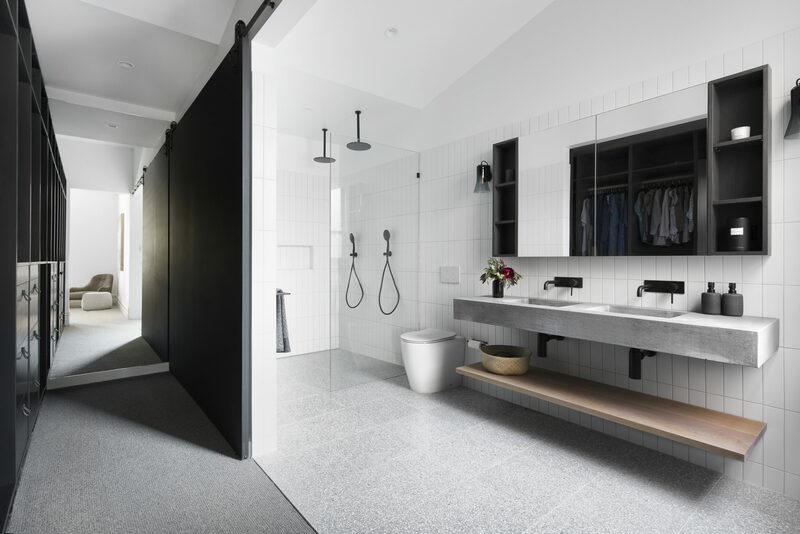 The bathrooms also feature custom made concrete basins and benchtops, limed oak shelving and Fibonacci floor tiles – a personal favourite of ours! A face fixed sliding door that runs the length of the ensuite creates the jaw dropping space that everyone dreams of. 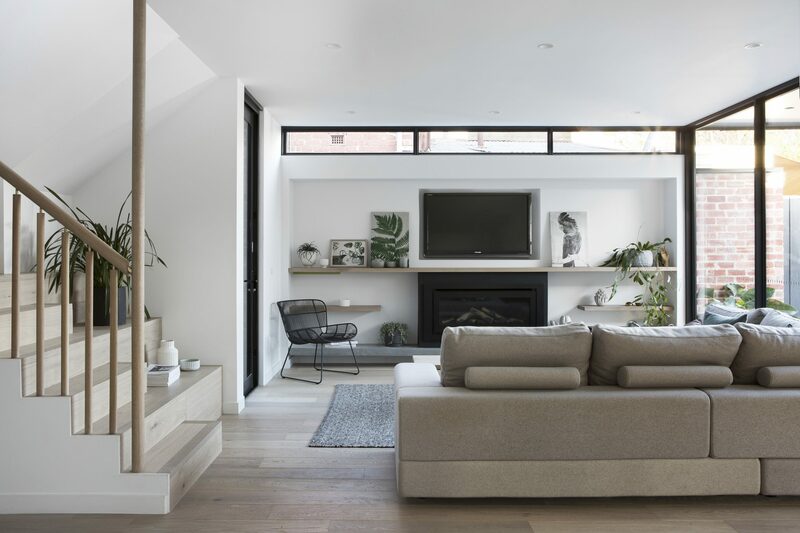 The combination of features big and small are what makes this home so special, from rumpus room with city views to the brass joiners in the stairs. 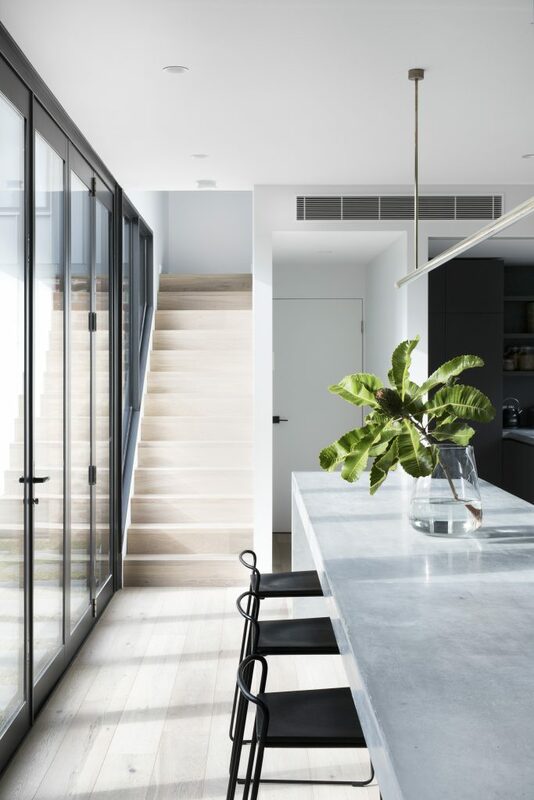 If you appreciate clean lines and attention to detail, be sure to check out this sensational home created by our wonderful, hardworking friends Darren & Jayne. All areas of the house have been captured by the talented photographer Dylan Lark, (@aspect11) though it is definitely one you need to see in real life! The handcrafted concrete bench tops in this project have a wonderful texture and appearance. Concrete pouring gives you the flexibility to create a custom design, allowing each bench top to be unique, continuous and seamless. Timber and concrete are a match made in heaven. 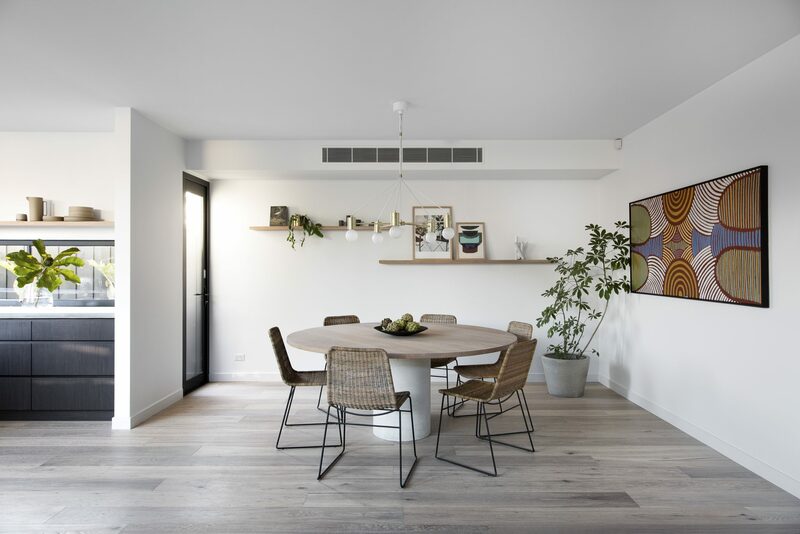 The bold concrete bench tops in this home have been softened with beautiful oak floorboards and shelving. Subtle brass touch points throughout make all the difference, from the brass light fittings to the brass joiners in the staircase.